Danish oil is a favorite of mine and I’ve been using it for years. It’s simple to apply and the results are consistent, at least until recently. The last 2 or 3 cans I’ve purchased (over the last year or more) have been downright syrupy in their viscosity. If I let it dry on the surface for the recommended 15 minutes or so, the excess will have turned to a honey-like substance—thick enough to drag the lint and fibers from even “lint-free” rags. I happened to pull an old can off the shelf last week, their ‘walnut’ color, which I bought at least 10 years ago and rarely use. When I applied that, it went on like water—just as it ought. Has anyone else experienced this? It’s possible that they’ve changed their formula, I suppose. Also possible that I have cans formulated to conform to our air quality rules (though nothing on the can suggests this). Just dilute it with some mineral spirits and that will get the viscosity you want! Out here in California, all of the finishes have new formulas. Even mineral spirits that AESamuel suggests as a thinner are different. And many of them only seem to be available in small containers. I think it is an issue that is unique to California, but the manufacturers might simplify their inventory by using the CA formula for everyone. Can’t you Commifornia guys just mail order what you want instead of buying the crap that they let you have? Last I bought at Home Depot In Alabama was just fine a month ago. Can t you Commifornia guys just mail order what you want instead of buying the crap that they let you have? My operation isn’t big enough to be inspected, so in theory, yes. But, a friend who does car interiors gets regular visits from the air quality management district. And the fines can be both large and hard to fight. I stick with what I can find at the store. Apparently, the stuff in Alabama is still kosher, so odd that there’s no mention on the package. How do they keep their inventory straight? I’ve kinda given up on the stuff they sell as mineral spirits—no punch at all. 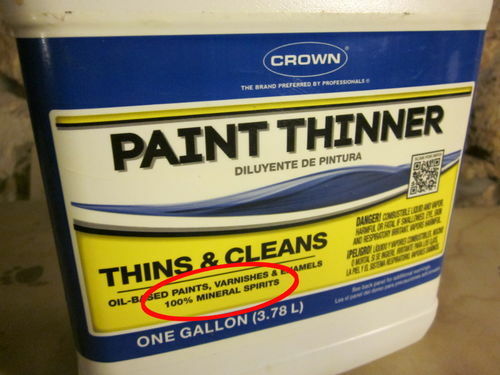 What’s marketed as paint thinner, though, seems to work ok as a substitute. Glad to know I’m not going nuts. They also have a low-VOC formula which doesn’t list water as the main ingredient, but shows it’s only 15-40% petroleum distillates and the rest ‘proprietary’ – but still says it’s non-flammable and to shake well before use. Still garbage. I have noticed that on some Watco Natural Danish oil, but subsequent cans have been nice and thin. It felt like it was full of resin. I’m using some Cabot Marine varnish right now for a mail box and it was as thick as this stuff. Danish Oil is kind of a generic term. There are lots of different products with varying ingredients that are labeled Danish Oil. “Tried and True” brand has less awful chemicals. As for the Watco, I haven’t noticed it being any thicker but I have noticed my home depot stopped carrying the larger cans. If you’re having trouble with the wiping off, try just letting it dry then rubbing it down with #0000 gauge steel wool. Danish Oil is kind of a generic term. There are lots of different products with varying ingredients that are labeled Danish Oil. “Tried and True” brand has less awful chemicals. As for the Watco, I haven t noticed it being any thicker but I have noticed my home depot stopped carrying the larger cans. If you re having trouble with the wiping off, try just letting it dry then rubbing it down with #0000 gauge steel wool. Yep, been doing a lot of that. One of my projects uses embedded rate earth magnets as door closers. It was a bear to get to fine metal particles cleaned out, but the finish came out ultra-smooth. I can decant Watco Danish oil into other containers and it lasts a long time, but the thick ones I had went bad pretty quickly. Like in a few days. I need to restate what I said cause I was thinking the Minwax brand of Danish oil not Watco which I have never tried sorry. I have noticed that on some Watco Natural Danish oil, but subsequent cans have been nice and thin. It felt like it was full of resin. I m using some Cabot Marine varnish right now for a mail box and it was as thick as this stuff. I wish there was some way to tell before I buy. I’ve had 3 or 4 bad cans, all Watco, in a row. I wore it down only minutes after application, which helps. Sometimes, though, it feels oily to the touch for up to a week afterwards. i was in the bay area working on the mil house, and looking for some stuff i use here in az, ole boy told me they hadn’t sold that stuff in cali in years, oh well, no wonder the paint falls off the joints over there so fast. As beautiful as Commifornia is as a state, I’ll never live or visit there. They’ve f’d themselves out of commission, it’s only a matter of time. If at all possible just mail order what you need and get the products as they were intended.